A video making the rounds on Facebook this week captures that fact better than most. The clip, uploaded by Mami Cano, shows the unforgettable moment a kindly brown horse made the acquaintance of a little human child. Bubbly as she may be, the horse shows the utmost patience and an openness to her snuggly affection. Despite the differences in their species, the pair seem to share an innocent bond of love and trust — the likes of which many of us grown-ups can only hope to achieve. Important Note: This is a trusted horse who had many experiences with kids, if you are not sure don't try this experience and respect the important rules. There are many horse organizations that teach kids about horses. Two of the most popular are 4H and the United States Pony Club. Both are excellent organizations whose goal is to teach kids how to ride and care for horses, so even if you didn't grow up on horseback, your child can. 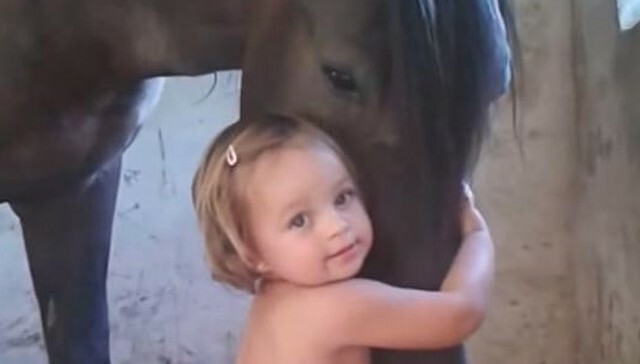 Responses to "Horse Discovers Just How Snuggly Little Humans Can Be"